A car, a boat, or a little bit of both?? Discussion in 'Transportation' started by steve f, May 16, 2005. He just headed for the boat ramp and kept going. This was taken a few years ago with my CP995. Thought it might be interesting to those who have never seen one before. I don't have any info on it other that I believe it dates back to the early 1960's or so. If anyone has any more I'd appreciate knowing. looks like an amphicar, made in germany in the late sixties. i've never seen one myself, but i've seen photos and videos on it. HA!! LOL!! Sure don't see those too often!! Nice capture! Boy that is different for sure. Never seen that before. I have seen one of those before. Not sure I would want to be on the water cruising with one of these. Thanks for the info. You may be right. I have to agree with you. Our lake can get fairly rough, especially on the summer weekends when all of the big boats come out and play. I can't imagine taking a big wave over the bow/hood of that boat/car. Sorry for the delay in responding. It took me awhile to search my photo files for the photos below. These were taken at the 2002 Clayton New York Antique and Classic Boat Show in upper state New York. 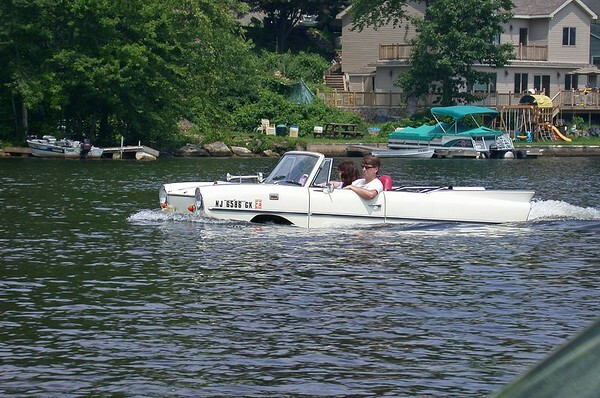 As Ricky mentioned it is indeed a Amphicar and they are becoming increasingly rare. I particularly like the plates. Thanks for the additional information. You're right, the license plate is funny. I spent a week on vacaton in the 1000 Islands quite a few years ago. We found a resort on one of the major islands, drove there from NJ, put the boat in their marina and never used the car again that week. One of the place we went to was Clayton. They have an antique boat museum there which was quite interesting. No amphicar there however. Definitely agree the Clayton/Thousand Islands area is a great boating area. The Museum sponsors the annual Antique Boat Show and Auction. This year the show is August 5-7. My recollection is that the owner of the Amphicar was at the show in 2001 and 2002 but I didn't see him the last two years.